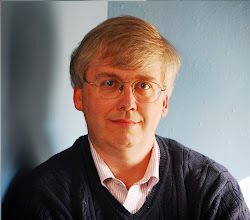 CONVERSABLE ECONOMIST: China's Economic Growth: Pause or Trap? China's rate of economic growth has slowed from the stratospheric 10% per year that it averaged from 1980 through 2010 to a merely torrid 8% per year from 2011-2014, and perhaps even a little slower in 2015. Now that China is on the verge of being the world's largest economy, the question of its future growth matters not just for 1.3 billion Chinese, but for the global economy as a whole. 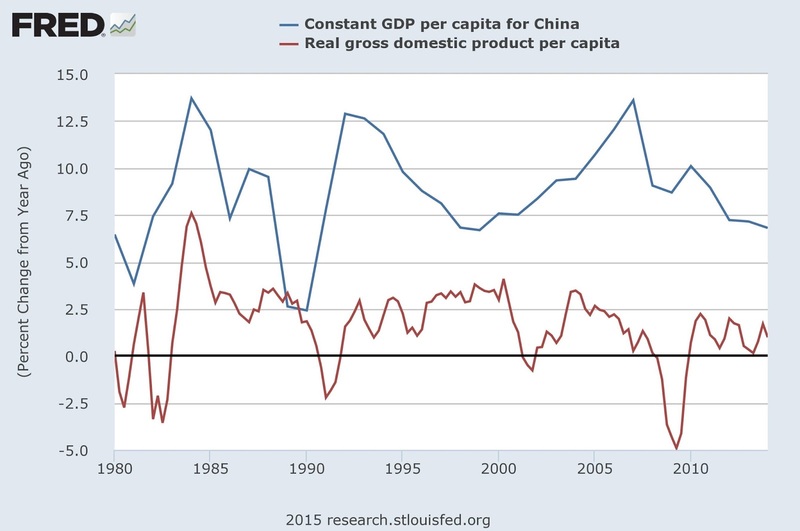 Zheng Liu offers some insight into the slowdown in a short essay "Is China's Growth Miracle Over," published by as an "Economic Letter" by the Federal Reserve Bank of San Francisco (August 10, 2015). 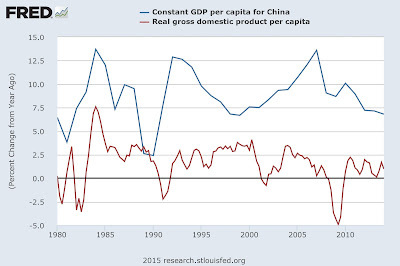 For some overall perspective, the blue line shows annual per capita growth of GDP for China. The red line shows annual per capita growth of GDP for the US economy. These differences in annual growth rates are extraordinary,and they do add up, year after year after year. In the last few years, China's growth patterns have been heavily affected by a slowdown in its exports during the Great Recession and its aftermath, and by an enormous surge in debt. 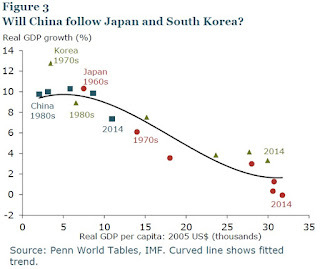 But over the longer term, the key question is whether China's growth rate slows down. Liu offers a thought-provoking figure here with a comparison of China with Japan and South Korea. China's growth is shown by the rectangles and you can see, for example, that it's growth in 2014 was below the earlier levels from the last few decades. Japan's growth is shown by the red circles, and you can see how its growth fell from the 1960 to the 1970s, and more recently to the circles at the bottom right. Korea's growth in shown by the triangles, and again, you can see the decline in growth rate over time. So is China's going to keep growing at a annual rate around 7%, or will it fall down to the 2-3% range? Here's the capsule case for pessimism, and then for optimism, from Liu. China had a real GDP per capita of about $2,000 in the 1980s, which rose steadily to about $5,000 in the 2000s and to over $10,000 in 2014. If China continues to grow at a rate of 6 or 7%, it could move into high-income status in the not-so-distant future. However, if China’s experience mirrors that of its neighbors, it could slow to about 3% average growth by the 2020s, when its per capita income is expected to rise to about $25,000. I'm a long-term optimist about China's economic growth, both because I think it has been laying the basis for future growth by boosting education, investment, and technology, and also because China's economy as a whole economy (not just the richer coastal areas) still has a lot of room for catch-up growth. But China's economy has reached a size where it urgently needs better functioning from its banks and financial system, and in the shorter term, the problems of the financial system are likely to keep getting the headlines.